Composer Darrell Katz Offers Large Ensemble Jazz and Social Commentary. 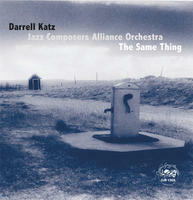 On The Same Thing (Cadence Jazz Records) composer Darrell Katz and the Jazz Composers Alliance Orchestra cast a critical eye of the foibles of our times in an album of stinging social satire featuring eclectic, swinging and adventurous music for jazz orchestra that defies genre. Katz, one of the most artful and lyrical composers for voice in jazz, once again showcases the texts of Paula Tatarunis and singer Rebecca Shrimpton’s brilliant interpretations of his musical settings of Tatarunis’ poems. Special guest Mike Finnigan is featured on vocals and organ on the title track. While current events inspire much of the composition’s lyrics, the words provide a scaffold for some of Katz’s most memorable and carefully shaped compositions and arrangements. Two compositions turn their attention to the vagaries of love. “Like a Wind,” a new arrangement of Katz’s setting of a passage from Sherwood Anderson’s novel Winesburg, Ohio, is one of the most colorful arrangements on the disc. Shrimpton sings this sad meditation on the impermanence of love with intimacy and compassion, her voice set off by soft, dark-hued support from the orchestra. Pianist Dan Tepfer injects off-center rhythms, and trombonist Dave Harris, with his big, burly tone, bursts with vitality during their respective solos. Katz’s arrangement of bluesman Willie Dixon’s “The Same Thing” is about as unromantic a look at love as you can find. It features a gritty performance by vocalist and keyboardist Finnigan —an underground rock legend who’s recorded with Jimi Hendrix , Crosby, Stills, and Nash, Taj Mahal and Etta James—and a Maceo-Parker-meets-Albert-Ayler solo from alto saxophonist Jim Hobbs. Darrell Katz is director of the Jazz Composers Alliance (JCA), an organization he helped co-found in 1985. His music is heard on the Jazz Composers Alliance Orchestra CD\'s, FLUX (1992, Cadence Jazz Records), featuring Julius Hemphill and Sam Rivers; Dreamland (1992, Cadence Jazz Records); his improvisational cantata, The Death Of Simone Weil (2003, Innova); In Thru & Out (2004, Cadence Jazz Records); and Celebration Of The Spirit (2006, CIMP). I’m Me And You\'re Not, by The JCA Sax Quartet, vocalist Angel Gittens, and poet Paula Tatarunis was released in 1999. He\'s written over 50 pieces for jazz orchestra. The JCA Orchestra, the Darrell Katz Dreamland Orchestra, the Henry Threadgill Windstring Ensemble, Orange Then Blue, Marimolin, Either Orchestra, and True Colors have all performed his compositions.